Jessica approached me about making an image for her son Lachlan after reading how much I was sharing about my process and myself through this forum. My ability to be vulnerable encouraged her to share more about her life and her love. That was an interesting lesson which arrived even before we met to create this photo. Shooting this image ended up being a great lesson in trusting the process of creation. 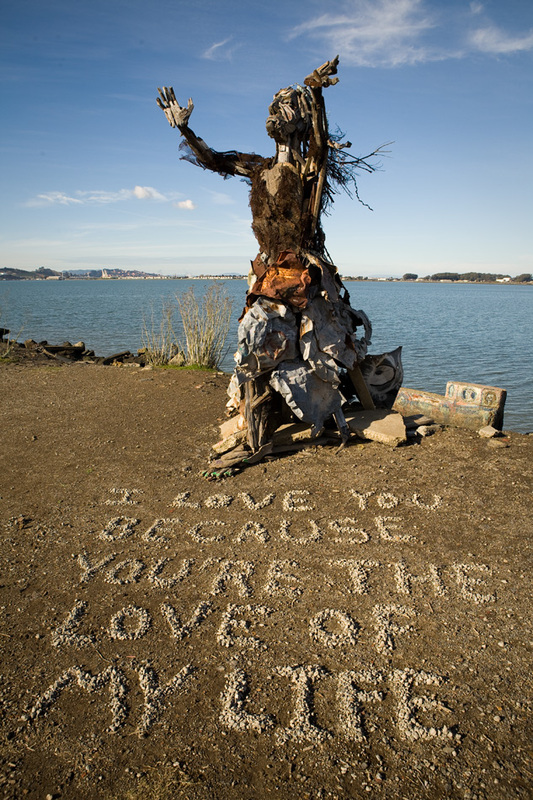 She wanted to make the picture in the Albany bulb, a peninsula of industrial landfill turned neglected parkland. The place has attracted artists of various stripes and colors that create sculptures out of the pieces of refused metal, concrete and wood. She and her son come here often; he usually stays on the beach fishing and she rambles around checking out the art. Her initial idea was to write the words in the sand on the beach but we both sensed there was something more inspiring than that. So we walked and talked and ended up in front of the sculpture you see above. I suggested we do it there and we started working. As we were creating the words, Jessica revealed that this has long been her favorite piece of art in the entire place. It’s even her Facebook profile picture! I was blown away by the synchronicity. Other similar things conspired shortly. We needed a bag to move gravel for the words and sure enough, there was a plastic bag lying on the ground. I needed a ladder to shoot from a higher angle — and presto, tucked behind one of the pieces of art was a ladder! On the walk back, I appreciated hearing about how her son is the person to whom she gives so much. Other loves may come and go but she is there for him forever. But I also liked hearing about all the other people in her life that Jessica gives to. She told me about how she put a huge amount of time and effort into a Burning Man camp she created simply because she wanted to facilitate an incredible experience for the people she cares most deeply about. The parallel between the sculpture in the photo — strong and giving — and Jessica herself was clear. At the end of the shoot, I walked away touched by Jessica’s generous heart. And I wondered if, somehow, that heart guided us right to where we needed to be. Click here to see a portrait of Jessica.